We went to a great BBQ restaurant over the weekend for my Dad’s birthday. There were about 15 of us (as usual) so we went ahead and ordered 2 HUGE platters of nothing but MEAT. Somehow we ended up with the leftovers (I honestly didn’t want them!). I heard a little mumbling about how if anyone could come up with a way to use them, it was me. Um, tell me something I don’t already know. I mean, this was a no-brainer. The next time you have leftover shredded BBQ chicken, or pork, or both (! )…don’t throw it away!! Do yourself a favor and make this. Preheat oven to 375 degrees. Add oil to pan and once heated, add onions and a sprinkle of salt. Turn heat to medium low and cook until somewhat caramelized, about 10 min. Add chicken, 1 cup enchilada sauce and cayenne. Add half of each type of cheese and mix. Turn off heat. Coat bottom of baking pan with enchilada sauce. Lay tortilla flat and place filling on one side. Carefully roll up and place seam down in pan. 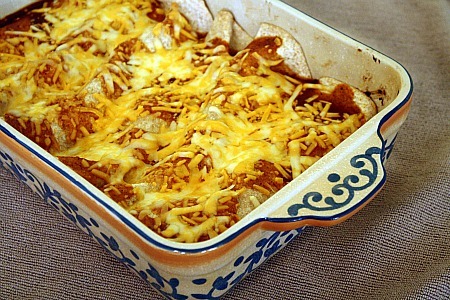 Cover enchiladas with rest of sauce and sprinkle remaining cheese on top. Bake for 20 minutes. Finish off with your favorite toppings, if desired. **If you feel there isn’t enough BBQ sauce on your leftover meat, simply add more! This entry was posted in cheddar, cheese, chicken, freezer friendly, make ahead, Mexican, QuickAndEasy. Bookmark the permalink. 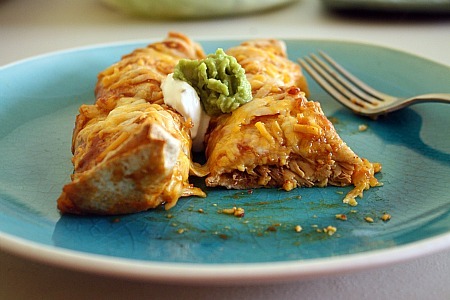 Two favorite foods/flavors in one cheesy, tortilla-wrapped package….mmm! 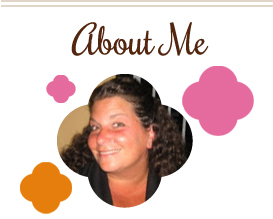 I’m sure you ARE the one who would know what to do with all those leftovers. 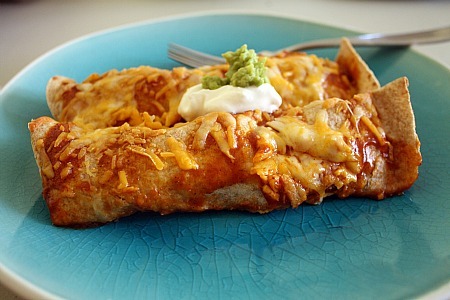 Case in point: these enchiladas. They look delicious! Genius! These sound and look so amazing, this will have to go on the table soon. What an awesome way to use leftovers…YUM! These look so good. What a great, and different way to use up leftover bbq. Great idea! We always have left over BBQ chicken and pork.